Inspiration at Sierra Club Activist Workshop! I was honored to be invited to lead a group of young leaders for Sierra Club’s Activist Weekend in a workshop on Gender and Climate. The participants were between the ages of 16 -26 and had been selected by Sierra Club from across the United States to join in a weekend of activist training. They will each be awarded small stipends to do activist projects in their own communities. The group of approximately 30 young people was mostly women and very diverse and enthusiastic. I shared video, images, and information about the impact of climate change on women in Bangladesh and the disparate gender impacts worldwide from this global environmental challenge. We also identified the key contributors to climate change. Participants were asked to make specific pledges to reduce their individual carbon footprints. 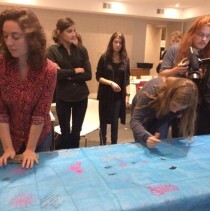 After the pledges were written down, we worked together to create a sari to be worn by a coastal woman in Bangladesh. 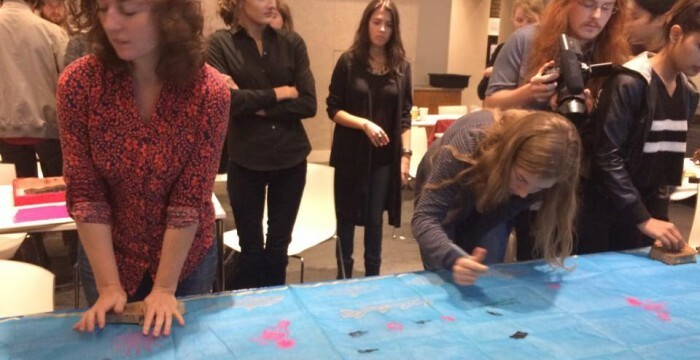 Everyone learned the technique for woodblock printing on fabric and contributed to the design of the sari. We used a shad fish (Ilish) woodblock with silver metallic paint to make a gorgeous border for the blue sari. The climate pledges were transferred onto the sari. I was moved by the conversations I had with several of the participants. One woman stated that she was from Mobile, Alabama, and like the people of coastal Bangladesh, they experience frequent, severe storms and hurricanes. Another participant related that she is an artist and was interested to see how art could be integrated into an environmental project. She said, “I made a lot of objects in college, but they were meaningless. This sari symbolizes climate resilience and is going to worn by a woman who needs a garment.” We filmed some of the conversations, and I hope they will appear in my future film about climate change. We had such a large and hard-working group that the entire sari was finished in one session. Photo: Copyright 2016 Monica Jahan Bose.